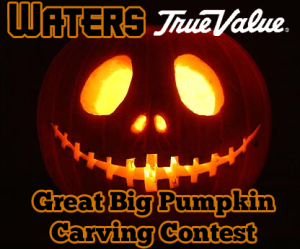 Water’s True Value in Salina wants to see your pumpkin carving skills! It’s October, and Halloween is just around the corner. Time to get our spook on! Pick out your best pumpkin and show us your skills in making the scariest, prettiest, or most unusual carved pumpkin around for this year. Water’s True Value is putting up a $50 gift card to the winner of the “Best Carved Pumpkin” around. The Salina Post is going to ad $50 in cash, plus other prizes for the holiday! It’s that simple! Get your pumpkin, and everything you need for a great carving at Water’s True Value on Ohio in Salina. You can also get all your gift needs at the Water’s gift shop. Water’s also has a full rental department for weddings, large projects, and more including a great selection of tools!